Home Players And Rumors Roberto Aguayo comes up big in Prime Time win! For the first time in the last seven meetings with the Carolina Panthers, the Buccaneers emerged victoriously. 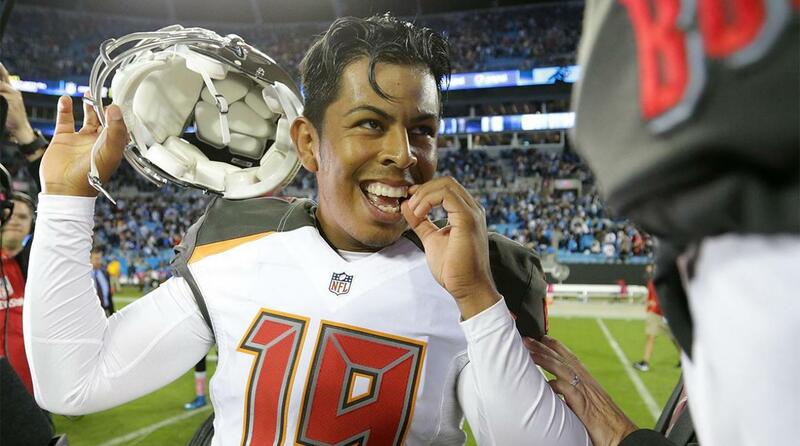 Playing on Monday Night for just the third time since 1998, Buccaneers kicker and almost ex-kicker Roberto Aguayo kicked the game-winning field goal with just 0:03 seconds left in regulation. Winning this game heading into the bye was vital not only for contention but for overall team morale. With Aguayo still being inconsistent, it’s hard to ignore the effect his botched field goals have had on the offense as a whole. Letting a game-winning kick rest on his mind for two weeks could really benefit not only his confidence but his teammates and coaches confidence in him as well. Had he missed that field goal, there is a good chance he could have woke up this morning without a job. Nobodies breakfast will taste better on Tuesday than Robertos. The Buccaneers will use the time off for much-needed rest and nursing of injured players. Look for several injured players to return after the break like Gerald Mccoy, Doug Martin, Clinton McDonald, and Robert Ayers. It’s a long season and we’ve only just set sail. Go Bucs! Previous articleCharles Sims placed on IR and running back Russell Hansbrough promoted. Next articleRodgers shines on the big stage.